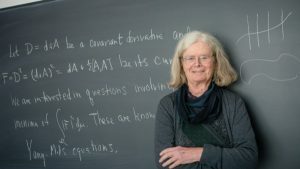 Dr Karen Uhlenbeck is the 2019 Abel Prize winner for “her fundamental work in geometric analysis and gauge theory, which has dramatically changed the mathematical landscape. Her theories have revolutionized our understanding of minimal surfaces, such as those formed by soap bubbles, and more general minimization problems in higher dimensions” [Hans Munthe-Kaas, Chair of the Abel Committee, photo credit Andrea Kane IAS]. Uhlenbeck is the first woman to receive this award, though “it’s far from the first time she has broken through a glass ceiling” [Erica Klarreich, Quanta Magazine]. In a NY Times interview about this award, she claimed Julia Child as a role model, which seems like a perfect comparison to me because both Uhlenbeck and Child are bold and original thinkers who changed the world simply by insisting on being themselves in it and by knowing that the world needed to grow space for them to be. I do not know Uhlenbeck particularly well, but she was a powerful voice in the department when I was a graduate student at UT Austin. I first noticed something distinctive about the department on my campus visit as a prospective student. Compared to my other experiences, the graduate program seemed significantly more diverse and supportive. In particular, I got a sense on that first day that women and people of color felt more at home in the department than at other programs and that (all of) the graduate students valued and felt bolstered by this diversity. The department was and is by no means perfect, and I’m certainly more sensitive to some marginalizing factors than others, but I could tell that something was different here. Building and sustaining this kind of culture takes many factors and agents acting together, and Uhlenbeck was a central pillar, like a force of nature for growing this community. As the UT News piece about her award identifies, Uhlenbeck was part of creating multiple, ongoing, formal programs that support the mathematics community. But Uhlenbeck also did this work through all of her informal relationships with us as graduate students. When I heard of this award, I was immediately reminded of the ways that these former graduate students continue to mention the impact that Uhlenbeck’s support had on them over the years, so I asked them to contribute reflections. In what follows, you will find stories of the profound good that she did through both subtle and explicit acts of human decency. I hope readers will feel challenged to be the kind of advisor and mentor Uhlenbeck was to each of us. As mathematicians, we think deeply about what mathematics we want to share with our students. We think about all of the beautiful aspects of the discipline that they might be interested in. As mathematics educators, we also think about how to help our students learn these ideas. We do our best to develop meaningful activities that can engage our students in the deep work of really doing mathematics. It takes considerable expertise to understand mathematics and to teach it well. At the same time, it can be easy to overlook who gets to participate in the activities we create. When we facilitate a discussion, how do we make sure all students are getting a chance to participate? How do we keep track of the students who do have access to opportunities to learn in our classrooms, and what do we do when we notice some students don’t seem to be getting a fair chance? 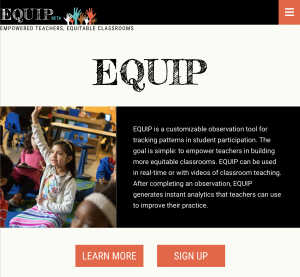 This blog post focuses on one tool, EQUIP, that can help address these issues (see Reinholz & Shah, 2018; Reinholz, Bradfield, & Apkarian, in press). The year is coming to a close, and for mathematicians that means that the Joint Mathematics Meetings are just around the corner. This year, the meetings will be held in Baltimore from January 16-19, and we are expecting about 5000 people to descend on Charm City. I was recently told by someone that they were “eagerly awaiting” the inclusion/exclusion roundup of diversity and inclusion events, talks, panels, receptions, happening at the meetings, similar to what we did for the last JMM. Not ones to disappoint our readers, we are happy to comply. About a year ago, the American Mathematical Society (AMS) agreed to take part in the National Science Foundation-funded STEM Inclusion Study. The study’s goal is to identify potential mechanisms of disadvantage at the interpersonal, organizational, and professional levels in science, technology, engineering and math (STEM) fields. It is the first large-scale, national-level study to simultaneously examine the experiences of women, racial and ethnic minorities, persons with disabilities, and lesbian, gay, bisexual, transgender, and queer or questioning individuals working in the STEM workforce. The study has two phases: first a survey of large samples of the members of participating professional organizations, then in-depth interviews with selected survey participants. By participating in the study, professional organizations not only guaranteed that their members will be represented in the broad results of the survey, but they also received a summary of their member’s answers to a small subset of the survey questions. The summary provides some insights into the beliefs and experiences of our members, specifically concerning their places of work, but does not provide any of the details that researchers expect to glean from follow-up interviews with a smaller sample of the survey participants. (Note that for most of this analysis, only respondents who were employed at the time were included, with graduate students included only when comparing responses across employment sectors.) The goal of this post is to share the results in the summary received by the AMS. Uniform Convergence is a one-woman play, written and performed by mathematics graduate student Corrine Yap. It juxtaposes the stories of two women trying to find their place in a white-male-dominated academic world. The first is of historical Russian mathematician Sofia Kovalevskaya, who was lauded as a pioneer for women in science but only after years of struggle for recognition. Her life’s journey is told through music and movement, in both Russian and English. The second is of a fictional Asian-American woman, known only as “Professor,” trying to cope with the prejudice she faces in the present. As she teaches an introductory real analysis class, she uses mathematical concepts to draw parallels to the race and gender conflicts she encounters in society today. In 2016, at a graduate school open house, I was told by a math professor that I would fit right in because they had “a large group of international students from China.” I responded, “Oh, I’m not international; I’m from Missouri.” He replied, “Well, yes, but it would be a good group for you.” Throughout my life, I’ve had many little exchanges like this. Uniform Convergence was not born out of these experiences but rather out of my struggle to discuss these experiences (and race in general) with other people. Programs supporting girls in STEM are becoming more and more common. But we believe there is a gap in these offerings: General STEM programs tend to leave out the M, at least in the way that a mathematician would define Mathematics. Most of the math centered programs for girls focus on students at the undergraduate level or higher. The math programs for high school girls that are out there tend to be designed for the top students who are competitive enough to win a spot. These programs are important as they offer much needed support for talented young girls, but what about the girls who think they’re not good at math? We know they’re out there. Research has shown that girls as young as 3rd grade start to believe they struggle with math even though they perform as well as their male peers who see themselves as capable. If we want to address the low number of female mathematicians, we can’t limit outreach to high schoolers who managed to make it past the first hurdle. The reason that more girls don’t enter mathematics is not simply that they didn’t have the opportunity to study it. Women and minorities do not see themselves represented among mathematicians and therefore do not see the field as one that is available to them. Underrepresented groups also often report feelings of social isolation that contribute to decisions to leave mathematics. 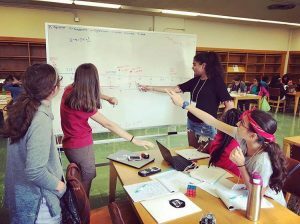 When we dreamt up the Girls Talk Math summer camp, our goal was to create a program that not only introduced high school girls to fun and exciting mathematics, but also addressed the issues that we know would prevent these girls from continuing in mathematics. No one program can address every barrier girls face in entering mathematics or engage every under-confident student, but we wanted to reach some of the young women who underestimate their mathematical abilities to increase their confidence. We developed a non-traditional math camp with the goal of attracting non-traditional math students from a variety of backgrounds. We hope our approach, the lessons we have learned from implementing it, and our camp curriculum (now freely available online) will be useful to others engaged in similar outreach initiatives. Welcome to Math Class, I am Professor I-Get-To-Have-A-Name. I will probably never learn your name, and that is okay. Who you are doesn’t matter. I may try to get you interested in math, but not actually you because I know nothing about you. I am basically never talking to you. First we’ll go over the syllabus. In the syllabus you will find rules, policies, percentages, office hours. You will not find anything here that matters to you. You will not find a reason to care anywhere within these pages. I will ask you if you have any questions on the syllabus, and then we will start the first lecture. You may not know it yet, but I’ve already lost you. You have several other classes, and other work or family obligations, or maybe you’re struggling to manage your social life or your mental health. Either way, mine is not your only class. But it’s a new semester and you are totally going to put a lot of work in for all of your classes. Things don’t play out the way you expect. You do the homework. You don’t get it all right, but this is how you learn, right? Your quiz scores aren’t what you’d hoped for; guess the class is hard. You don’t come to office hours, because you don’t know office hours are for you. At any rate, if you just study really hard for the midterm, it’ll be okay. At any rate, if you just study really hard for the next midterm, it will be okay. You send me an email, if you just do really well on the final will it be okay? Now you reach out to me, you really really really need to pass the class and you’ve struggled all semester with personal issues and you’re certain you’re ready for the next class, because next semester your life will be settled and you can really study hard all semester long you just really really need to pass. This summer, I have helped lead a professional development workshop for mathematics educators on student-centered pedagogy. One session of the workshop  is organized around a paper by María Trigueros and Sally Jacobs entitled “On Developing a Rich Conception of Variable”. Trigueros and Jacobs argue that the concept of “variable”, which seems unified from an expert perspective, is multifaceted. Moreover, they point out the ways that this multiplicity is challenging for students and that there are structural issues with our curricula that fail to support the development of a rich conception of variables in most students. Faculty can easily take a deficit perspective on students whose conceptions are unlike our expert perspectives, and this concept in particular is at the root of a lot of the blame we lay on students when they think differently than we expected. 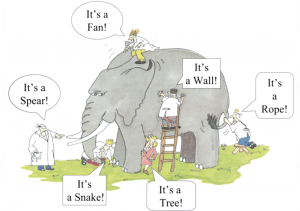 At the workshop, we use this image of an old parable about scholars and an elephant. The elephant represents the concept of variable, and the scholars each describe an important facet of the concept: as unknowns, general numbers, parameters, co-varying quantities, or something else. The point is that student conceptions of variables are reasonable attempts to make sense of the contexts in which we have placed them and judging them for not having integrated those contexts into a unifying concept feeds into some of the structural issues with our educational system. 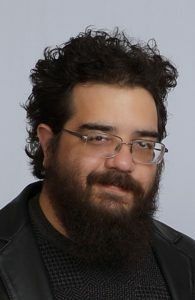 I’m an associate professor of mathematics at Rio Grande College, a branch campus of Sul Ross State University consisting of three geographically separated units in the middle Rio Grande border region of Texas. I teach four or five (or six) courses each semester, all different, all at the junior, senior, or graduate level, and all through distance-learning equipment. Students transfer from the local community college. Roughly speaking, the student body is about 70 to 90 percent Hispanic, female, first-generation, and low-income, with an average age around 30. I received my doctorate in 2009 and began work at Rio Grande College immediately thereafter. I’m of Puerto Rican descent, and my graduate work was supported partly by the Ford Foundation Predoctoral Fellowship for Minorities. I grew up on the south side of San Antonio, Texas, and, later, in a small town to the west, within the service region of my current institution. I drafted these reflections while attending the recent National Inquiry-Based Learning Conference in Austin, Texas, much of which focused on inclusion and equity. I’m a member of an ethnic minority underrepresented in STEM fields; I also have an autism disorder, which went undiagnosed until I was midway through graduate school. Actually, it was grad school that prompted me to seek a clinical evaluation. I’m hoping that my account might be helpful to someone. It’s impossible to tell whether a given effect might have been related to my ethnicity, my disorder, or my own shortcomings, so I’ll leave it to the reader to connect the dots as they will. I’ll begin with my autism disorder, which has had the greater impact.